Provides a versatile method of controlling listed insects and diseases. 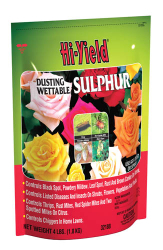 Can be used as a dust or wettable spray on Roses, shrubs, flowers, fruits and vegetables. Provides a versatile method of controlling listed insects and diseases. Controls Black Spot, Powdery Mildew, Leaf Spot and Rusts.